Kobe Rokko opened its doors in September of 2005. Our school focuses on children’s English conversation, and is filled with energetic students and our friendly staff members who are ready to welcome you at the door. Our warm and welcoming staff members are awaiting your visit at Amity Rokko. Come and see for yourself!! Our school is close to both nature and downtown Kobe. Mt. 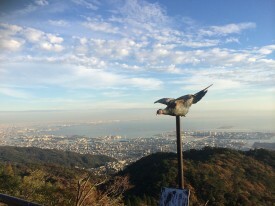 Rokko is popular for hiking, and Sannomiya, the heart of Kobe, is less than ten minutes away. On this street, close to Amity, you will find popular supermarkets, drug stores, banks, convenience stores, an internet cafe and great restaurants. The kids at Amity always enjoy a fun, energetic lesson. Many students get one-on-one lessons with teachers, especially during seminars. I like learning alphabets and phonics with my teacher. Now I can write alphabets and read some words. We love Amity! We sing and dance and have lots of fun learning English with friends and teachers! The English CD-ROMs we use, allows the children to enjoy learning the English language in interactive fun lessons.